Perhaps it's too soon for Christmas ? ! 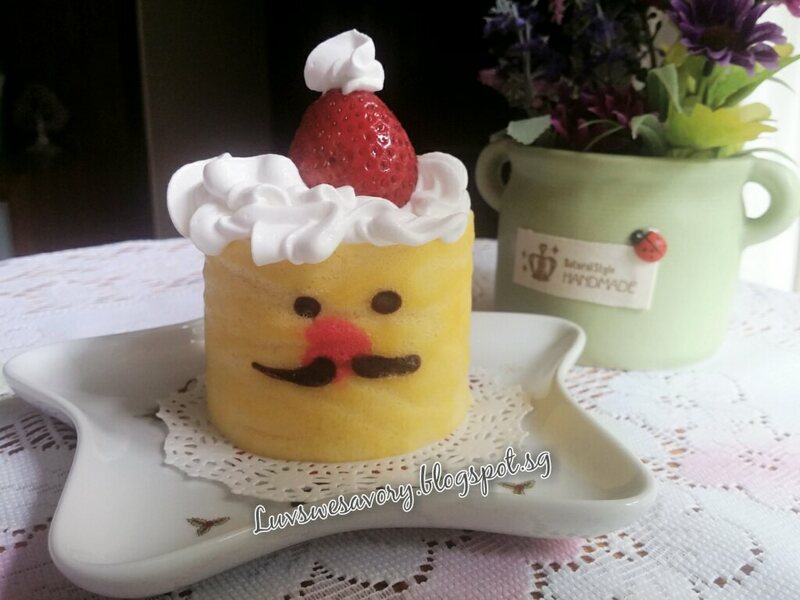 I'm sure the deco roll or decorated swiss roll cakes (made famous by Japan Junko) were such a big hit few years ago that I also jumped on the wagon to make a few back then. Well, I don't really like to draw with templates or stencils .... I prefer "free-style" ... hee... hee. . lol ! Making deco roll was quite fun too. Sometimes the pattern "got stuck" on the parchment paper, so ended up funny or weird designs. Sometimes the pattern got "smudged" ... Sometimes, the roll cracked ... so obviously, any of these flaws would affect the "masterpiece" of the artwork too. All the arrggs ! and haiz ! hee ... hee ! So it has been ages since my last deco roll .... I was inspired by this cute design Cherie Kelly Bunny Deco Roll, and I thought just to make something similar... Santa Claus! I just made the eyes, mustache and a pink nose. 1. To make the template ... on a clean sheet of A4 size paper, divide equally into 8 rectangle. Make markings for the eyes, nose and mustache in the middle of each smaller rectangle. 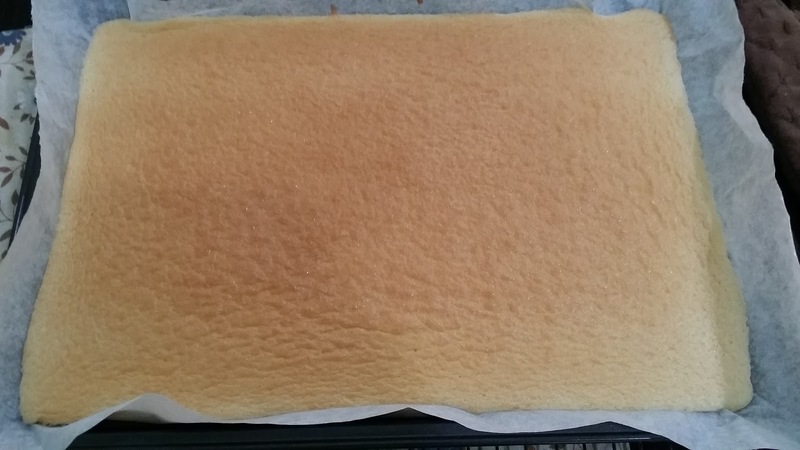 Place the paper on a large baking sheet. Top the greased parchment paper on the template. Set aside. 2. Position the rack in the center and preheat the oven to 180°C. 3. In a mixing bowl, whisk the eggs and caster sugar using an electric mixer in high speed for about 5 -7 minutes until pale, thick and fluffy in ribbon stage. The whisk leaves a trail when lifted up, mixture will fall back into the bowl in ribbons and slowly disappear back into the mixture. 4. Add milk and fold together until combined. Sift in flour and whisk for about 3 minutes on low speed to incorporate. 5. Batter for the eyes & mustache : Spoon 1 tablespoon of the batter and mix with 1 tablespoon of cocoa powder in a small bowl to form a chocolate paste. Put the batter into a small piping bag. 6. Batter for the nose : Spoon 1 tablespoon of the batter and mix with a drop of red food colouring in a small bowl. Put the batter into a small piping bag. 7. Pipe the features and nose on the paper according to the template drawn in Step 1. 8. Bake for 2 mins and remove the baking sheet the from oven. Remove the sheet of template leaving only the parchment paper on the baking sheet. 9. Pour the remaining batter into baking sheet. Level the surface with a spatula. Gently tap the baking sheet a few times on table top to release the trapped bubbles in the batter. 10. Bake in the oven for about 12 - 13 minutes or the top is light browned, and a toothpick inserted into the centre comes out clean. (The temperature of the oven may vary, do check, do not over bake the cake as it will be too dry and may crack easily when rolled). 11. Remove the baking sheet from the oven, immediately drop the baking sheet at a height onto a table top. This action helps to keep the springy texture of the sponge when it is left to cool. Leave to cool in the pan for 1 minute. 12. Remove the sponge from the baking sheet by lifting the parchment paper. Place parchment paper on the sponge cake (brown side), over turn and gently remove the parchment paper on the decor side. Cut the sponge into half along the template to have 4 faces in a vertical column. 13. Place a clean sheet of parchment paper on it, flip the cake over, remove the parchment paper with the brown side up. 14. 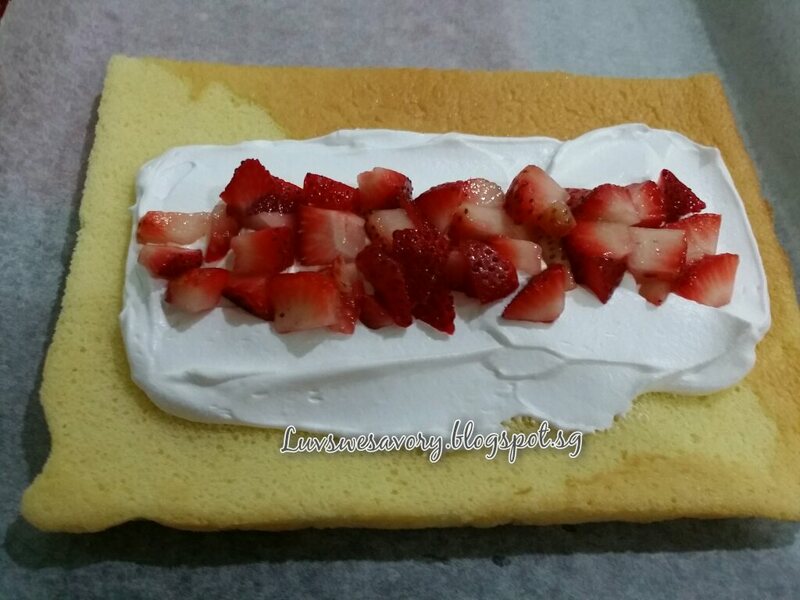 Spread the whipped cream in the center of sponge. Top with some diced strawberries. Roll up gently by lifting it up with the parchment paper. Place the rolled cake seam side down. Wrap with parchment paper and chill in the refrigerator for few hours. Repeat the same for the other half of the sponge cake. 15. Trim the ends using a sharp knife. 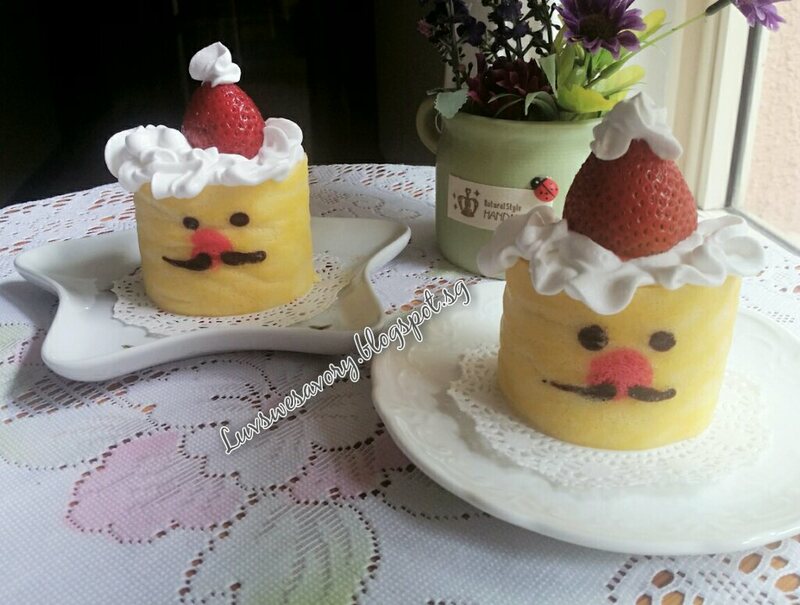 Cut into slices of each face, pipe some whipped cream on the 'head' and top with a strawberry as Santa hat. (Note: I've prepared the whipped cream in advance of baking and chill it in the fridge till ready to spread the sponge roll). Freeze the cleaned mixing bowl for about 10 minutes. Take it out from the freezer, immediately put all together the cold whip cream, vanilla extract and caster sugar in the cold mixing bowl. Use the electric mixer to whisk till stiff peaks form. Ha ! ha ! After the make-over with Santa hat, looks passable?! Think the next time I'll just pipe some whipped cream as beard ... lol ! Ho Ho Ho. Santa Claus coming to town. Is early for Xmas but I do like it. My Favourite festive season of the year. I love Swiss rolls and these are so cute. 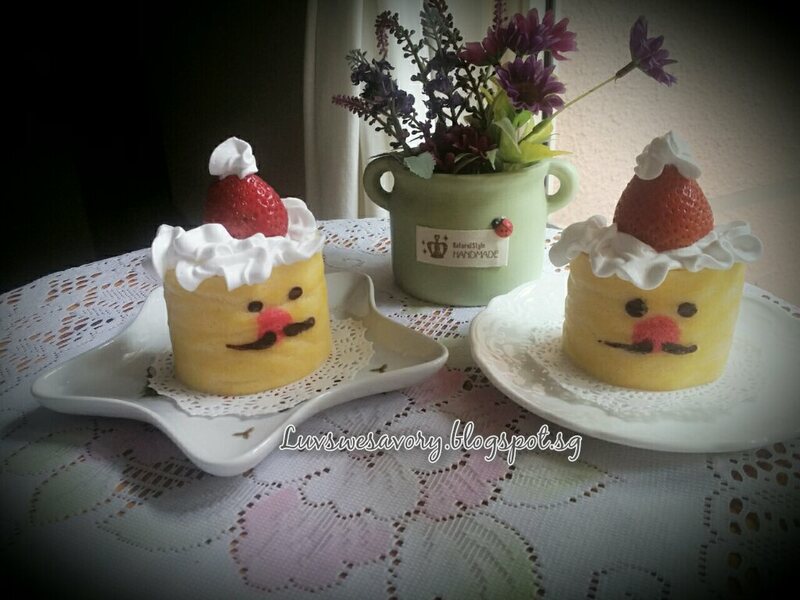 Great for Christmas celebration! Hi Karen, these are so adorable. Here in the US I am watching the hallmark channel on TV and they are having a Christmas in July series, these are perfect. Hi Karen, your swiss roll is so cute and adorable. Excellent, great for Christmas gift. Thanks for sharing your idea. Hah! This is too cute, Karen ..and I would have said 'early for Christmas' but would you believe that I'm all done with my Christmas gift shopping for this year? Yup, I am and feeling so pleased with myself...lol. Wow ! You are done with Christmas gift shopping ! LIKE ! How adorable! 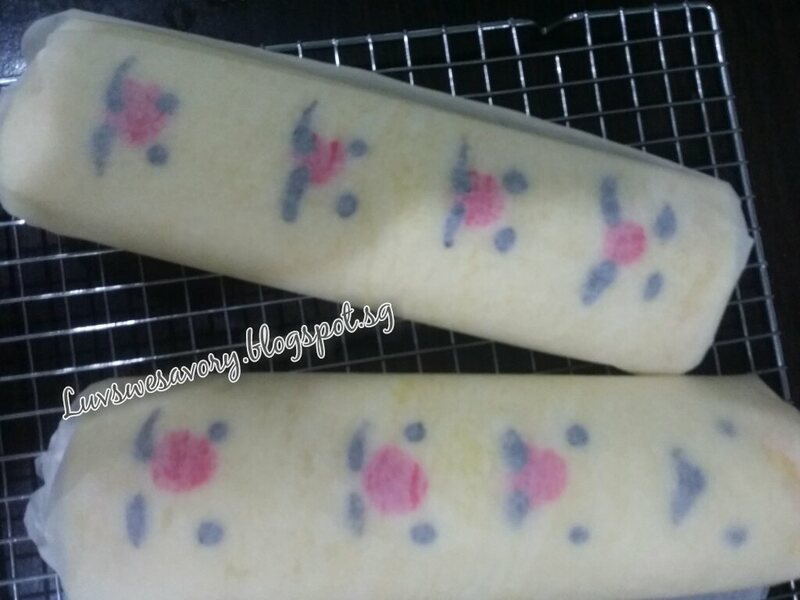 I don't mind celebrating Summer with this beautiful and delicious cake roll!